I've never been an overly patriotic type. I do love this country even though it drives me crazy sometimes. But, I've never been one for wearing shirts with our flag on them and that sort of thing. The ideals of America run deeper then that for me. It's a whole lot more than flying a flag on my front lawn, or wearing a flag lapel pin on my suit jacket. You have to walk the walk too. Freedom, real freedom, as it was espoused and celebrated in our country's formative years, takes a lot of work and a lot of patience. Sometimes, actually it seems all too often, as a nation, we lose sight of that. And that's where I'll end the political discussion for today. After all, this isn't Politico. We're here to talk about Walt Disney World aren't we? Last time, we were in Italy on our sojourn around Epcot's World Showcase and that means that we've hit the middle. We're halfway around the lagoon. And what is it that you find halfway around the lagoon? 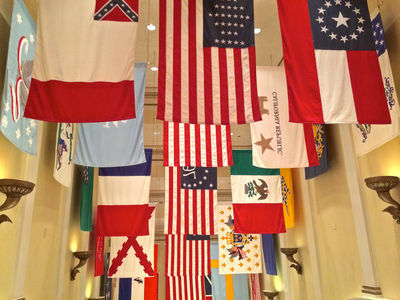 The American Adventure in all its patriotic splendor. Now, in this writer's personal opinion, The American Adventure isn't actually a country pavilion like the other nations that surround World Showcase Lagoon. I refer to it as more of an anchor. The host nation needs its own special place and that place is dead center hallway between your "visiting" nations. 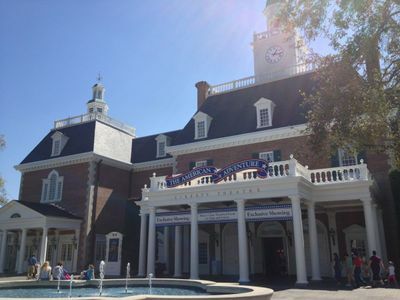 The American Adventure has no full-service restaurant, only one small shop, and lacks a "village" area like many of the other pavilions have. It's a different beast altogether. I've seen concept art that actually had an American pavilion of sorts on the other side of the lagoon. You would have exited Spaceship Earth, walked past what is now the fountain area, and you'd be faced with a large building celebrating America. That notion created what I would imagine would have been major traffic flow problems, not to mention how it would potentially obstruct the view across the lagoon. The current placement makes much more sense. I owned up to being Italian and not spending too much time in the Italy pavilion, and now I'm going to own up to being American and not spending too much time in the American pavilion. More often than not it's something we pass by on the way to the neighboring nations. Unless we have a specific reason for stopping, we typically don't. That isn't to say that there's nothing to see here. There definitely is. Let's take a closer look with my Top 5 things to see in Epcot's American Adventure. I'm a big concertgoer, and have been since I was 14. I'm always curious about performance spaces. I find myself thinking, "What would it be like to see a show here?" I'm big on atmosphere. Any band can play in any venue anywhere, but there are some venues that have a distinct feeling. I've often heard Phil Lesh, bass player for The Grateful Dead, say the following about the legendary Capitol Theater in Port Chester, New York, "You can just feel the history dripping from the walls can't you?" And my other rock hero, Bruce Springsteen has been very vocal about his love of the old, weird, cramped hockey and basketball arenas that he grew up playing in rather than today's more sleek and polished venues. While I don't imagine I'll ever get to see Bruce or the Dead play in the America Gardens Theater, it is a heck of a place to see a show. 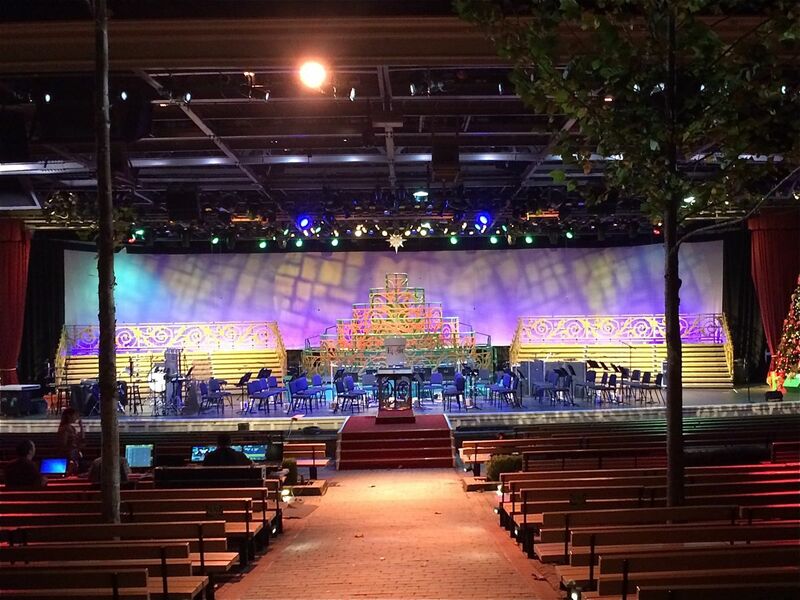 The Candlelight Processional in tech rehearsal at Epcot's America Gardens Theater. Photo by J. Jeff Kober. Grab a drink and a Mickey pretzel and head for a seat alongside the lagoon and listen to some great music at any of the concert series that call the stage home. Better yet, go during the holidays and listen to the ethereal sounds of the Candlelight Processional. Like many of Epcot's best pavilion offerings, The American Heritage Gallery often goes overlooked by the average guest. I'm frequently amazed at how alone I am at that gallery in the back of the Japan pavilion, or walking through the gallery in China. I realize that it's a theme park vacation for most people and rides, attractions, and shows rule the itinerary. But, Epcot is a little different. Stop in and look through these places. 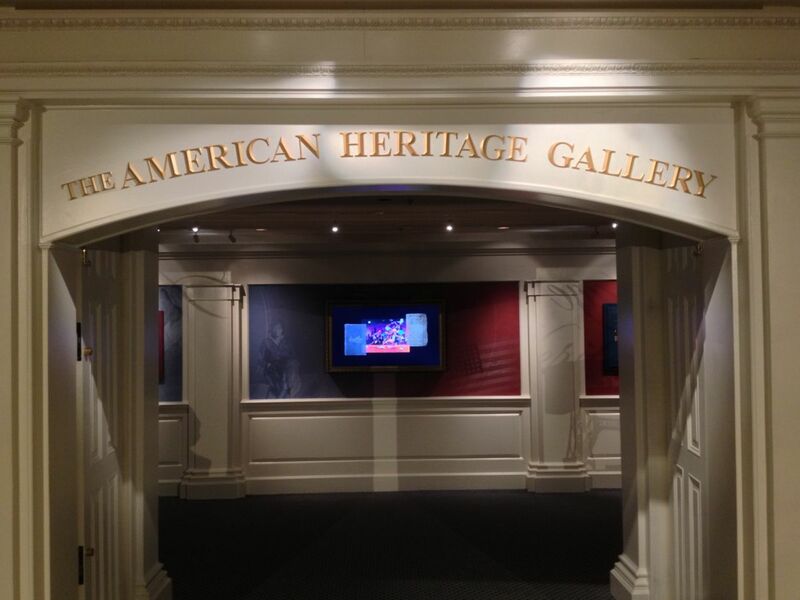 The American Heritage Gallery at Epcot. Photo by J. Jeff Kober. The collections typically on display in the American Heritage Gallery are literally pieces of American history right there before your eyes. Go see them. Mickey will be there when you get out I promise you. Remember the fact that when Walt Disney wanted to build his first dream park, Disneyland, he went to his moviemakers and set designers to make his stories come to life. One of the movie tools they used to make places like Main Street U.S.A. come alive is forced perspective. You can't have a real three- or four-story building on Main Street. It would dwarf the guests. So they give the impression that the buildings are getting taller through forced perspective. Each story actually gets smaller. The same goes for Cinderella Castle. The American Adventure Building in Epcot's World Showcase. Photo by J. Jeff Kober. For the main building of the American Adventure, they did just the opposite. The massive scale of the attraction within demanded a massive building. However, colonial America would not have had a five-story building. So the Imagineers made the building look like it's actually not as big as it is from the outside. It was designed to look like it's only three stories, but it is in fact five stories. Look closely the next time you're there. It's a cool effect and unique to Walt Disney World. The attraction inside the aforementioned building is a tour de force when it comes to the Imagineers' arsenal of effects. It's as impressive as one can get from the moment you walk in. The collection of American flags as you walk up the stairs is an impressive site. The amazing statues that line the walls of the theater, as well as the theater itself, let you know that you're in for something special. Once the program begins, sit back and feel patriotic, but please try to consider the enormous effort that's been put into changing all of those sets and getting all of those animatronic figures to do what they do. The soundtrack is beautiful and emotional. The montage at the end will leave you with that lump in your throat and weepy-eyed feeling that a great Disney attraction is meant to elicit. Despite the enormity and complexity of the American Adventure main attraction, it's these 9 people dressed in colonial garb singing their hearts out that gets my number one vote for this list. I'll never forget the first time I simply wandered into the building, new to the park and not sure what to expect. What I heard took my breath away. Part of it is the obvious talent of this a cappella group. The other part is the fact that they are singing underneath an acoustically perfect dome that literally makes their collective voices soar to amazing heights. 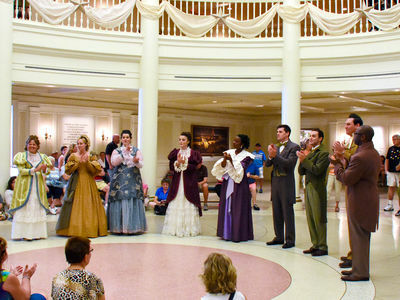 The Voices of Liberty perform seven days a week under the dome inside The American Adventure. Photo by Donald Fink. On any given day, I'll be singing Truckin' or Born to Run in my head and not Yankee Doodle Dandy, but that doesn't matter here. Stop, listen, and be impressed. Make it a point to stop in and see their performances even if you're not going to experience the attraction—especially during the holidays when they mix in Christmas favorites. Once again, I typically don't spend too much time at The American Adventure. If I'm going to eat in Epcot, it's not going to be burgers and fries. I have absolutely taken the kids to The Liberty Inn, the pavilion's counter-service dining establishment, for chicken tenders and fries when I needed to get some food in them. I also can't knock the funnel cakes and Mickey pretzels. However, just because I'm usually not hanging around this pavilion doesn't mean that there's nothing to see here. I'd say there's less than some of the others, but the architectural details of the main building, the awesome collections inside the gallery, the impressive attraction technology, and the wonderful sounds you can hear inside and out all make for a great experience. It's time to move on to another nation. Before I do, take a moment, click on the link below, let me hear your thoughts, and I'll see you next time with another Disney Top 5. As soon as I saw the title of this article, I was wondering if you'd list The American Adventure as number 2, and the amazing Voices of Liberty as number 1. If you're at all interested, members of this group also perform and record as Voctave, and there are several show-stopping videos online. Seeing them live is always a high point of any WDW visit. Yes, the Voices of Liberty are indeed the #1 thing at the American Adventure. We often go in just to hear them, then leave without seeing the show (we'll do the show once per trip, but we often see the Voices of Liberty three or four times). They're phenomenal, easily as good as well-known groups like the Swingle Singers. I'd have to put the new bathrooms on my list of the top 5 best things about the American Adventure, though. Easily my favorite bathrooms at Epcot, if not all of WDW! I'd probably leave off the America Gardens Theatre in favor of the bathrooms. I'd also place the VIP lounge above the forced perspective. It's open each year during the Food & Wine Festival to Chase VISA cardholders, and it's a fantastic space to hang out in, especially on a hot afternoon.